If you are new around here, we are licensed for foster care/adoption. The journey has looked a bit different than we originally thought it would, but it's been a great journey so far. We took the licensing classes in the summer of 2016, and during the beginning of the classes, we found out we were pregnant. At the end of the classes, we found out it was twins. Big surprise! 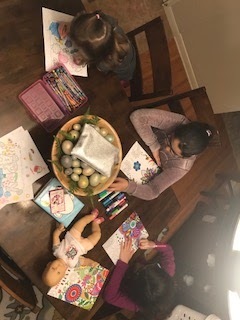 This is the last foster care update I posted, and since then we have done respite two more times for two girls, both times for the same family. This was really special, because we did respite for our friends (who we took the licensing classes with and who go to our church), so it was neat that we had met the girls already and had already had them over to our house for dinner. It made it less scary for them to go to stay with a complete stranger. Overall, it went really well. Of course, it's extra work to add two more family members (even though they aren't our biological kids, or even our foster kids, when they are staying with us, I feel like they are our kids and want to treat them that way! ), but they were really kind, respectful girls. Norah loved playing with them, for the most part (of course it's hard to all the sudden be expected to share your stuff with people you don't know). We had them over Easter weekend, so that was also a great opportunity to share all about what Christ did for us on the cross and to do fun Easter celebrations with them! Foster care is such a whirlwind. One moment I'll feel like I want to foster/adopt all the kids, and another moment I'll feel really overwhelmed, like we are filled enough in this current season and we can't handle more. We still have hearts for foster care, but for now are remaining on the respite list, and we will see where He leads in the future! We are so grateful to have been able to love on the kids that we have had in our home already, even though it was short. The first time we did respite, we were asked why we pray and they said that no one had ever told them about Jesus before. That still brings tears to my eyes that we were able to share with them. I don't know what happened to them or where they are now, but we pray that the planted seed would grow in their lives later. It's so hard sometimes, but so beautiful to be His hands and feet in such a tangible way to kids who are going through things that they never should have to and who need lots of love. So proud of you and your foster care journey!! 😘 Follow the Lord's leading and you can't go wrong! !